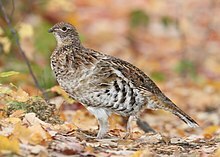 The ruffed grouse is sometimes incorrectly referred to as a "partridge", an unrelated phasianid, and occasionally confused with the grey partridge, a bird of open areas rather than woodlands. These chunky, medium-sized birds weigh from 450–750 g (0.99–1.65 lb), measure from 40 to 50 cm (16 to 20 in) in length and span 50–64 cm (20–25 in) across their short, strong wings. 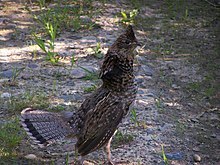 Ruffed grouse have two distinct morphs: grey and brown. In the grey morph, the head, neck and back are grey-brown; the breast is light with barring. There is much white on the underside and flanks, and overall the birds have a variegated appearance; the throat is often distinctly lighter. The tail is essentially the same brownish grey, with regular barring and a broad black band near the end ("subterminal"). Brown-morph birds have tails of the same color and pattern, but the rest of the plumage is much more brown, giving the appearance of a more uniform bird with less light plumage below and a conspicuously grey tail. There are all sorts of intergrades between the most typical morphs; warmer and more humid conditions favor browner birds in general. "More than any other characteristic, it is the ruffed grouse's ability to thrive on a wide range of foods that has allowed it to adapt to such a wide and varied range of habitat on this continent. A complete menu of grouse fare might itself fill a book. One grouse crop yielded a live salamander in a salad of watercress. Another contained a small snake." The ruffed grouse population has a cycle, and follows the cycle no matter how much or how little hunting there is. The cycle has puzzled scientists for years, and is simply referred to as the "grouse cycle". In spite of this historic cycle, populations have been declining in Pennsylvania and management plans adopted. Habitat loss has been a concern for the species, but the introduction of the West Nile virus has been seen to be further increasing mortality. ^ Gill, F.; Donsker, D., eds. (2015). "IOC World Bird List". worldbirdnames.org. International Ornithologists Union Committee on Nomenclature. doi:10.14344/IOC.ML.5.3. Retrieved 11 October 2015. ^ Stauffer, Glenn E.; Miller, David A.W. ; Williams, Lisa M.; Brown, Justin (2017-09-20). "Ruffed grouse population declines after introduction of West Nile virus". The Journal of Wildlife Management. 82 (1): 165–172. doi:10.1002/jwmg.21347. ISSN 0022-541X.